by W.G. Dunlop. AFP, Fri Dec 24, 2010 12:49 pm ET. 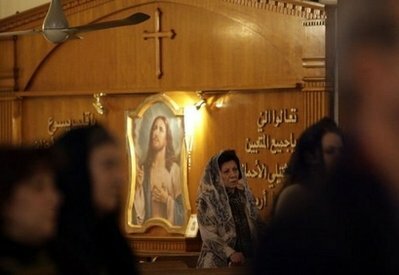 BAGHDAD (AFP) – Despite Al-Qaeda threats, about 40 worshippers gathered to mark Christmas Eve at the Saint Joseph church in central Baghdad on Friday, less than two months after a massacre at another church in the city. "Do not fear -- that is the message today," Father Saad Sirop Hanna, the head priest at the Chaldean Catholic church, told his congregation, after reciting the Christmas story in a half-chant, half-song. He gave that message "in light of the threats that we received and also the general situation that we've lived in and through these seven years" since the 2003 US-led invasion, Hanna, a 39-year-old Iraqi, said after the service. "The Christian community this Christmas is very afraid, very scared of the situation, and we take seriously the threats that we've received by Internet or by emails," he said. Chaldean Catholic archbishop Monsignor Louis Sarko in Kirkuk said on Tuesday that he "and 10 other Christian personages received threats from the so-called Islamic State of Iraq," or ISI, Al-Qaeda's local affiliate. The threats follow recent deadly attacks on Iraqi Christians. On October 31, militants laid siege to Baghdad's Our Lady of Salvation church, leaving 44 worshippers, two priests and seven security forces personnel dead in an attack claimed by ISI. Ten days later a string of attacks targeted the homes of Christians in Baghdad, killing six people and wounding 33 others. The small number of worshippers at Saint Joseph on Friday left the vast majority of the wooden pews in the softly lit, white-walled church unfilled. "This is not the actual number of our family -- these are some of them who decided to stay, to remain in Baghdad," Hanna said, noting that many Christians have left Iraq amid unrest since 2003. People are asking "'should we stay here, should we leave?' and these are very difficult questions to answer," he said. He wants to "continue his mission in this country" but "is afraid to give them an answer, to tell them to stay, and after that they are attacked or there will be something dangerous for them," Hanna added. The service was held under tight security, with the street in front of the church guarded by about 10 interior ministry personnel, most armed with Kalashnikov-variant assault rifles. Two trucks and a Humvee with a heavy machine gun mounted on top were also outside. Christians in northern Iraq were able to mark Christmas Eve in a far more relaxed setting, however. In Ainkawa, a village in Arbil province, Christians celebrated with Christmas music and Santa Claus distributing gifts to children. "The mass will start this evening, and will continue until Christmas day," said Bashar Wardeh, a Chaldean Catholic priest in Ainkawa. "There will be prayers all the night, and we will pray for peace in the country." "Today we are living in security and peace" in Kurdistan, said Mayada Bahjat, a 39-year-old Christian woman from Baghdad. "But we wish to return to Baghdad and to have peace in Iraq."